Stories from Norwegian culture and mythology have always fascinated me. Every Monday I try to find some of these stories to share with you. Some I find in my own back yard, some I translate from Norwegian folklore and some are researched online. The stories from Norse Mythology are based on “The Prose Edda”, an Icelandic collection of prose containing tales from Nordic mythology, written by the Icelandic scholar and historian Snorri Sturluson around the year 1220. With all the recent attention Thor has been getting in the movies, I thought it fitting to take a look at Thor’s mother. You know her better than you might think. Thor is the first son of Odin, father of the Asgardians, but little is said of his mother. Thor has a special love for Earth, more so than perhaps any other god. Like his father he is captivated by the beauty, the strength and endurance of earth. Thor is the protector of earth and it is not surprising since earth is his birthplace and Jord (Norwegian name for earth) is Thor’s mother. In Norse mythology, Jord, also known as mother earth is the mother of Thor. Jord is a giantess and reckoned a goddess, like other jötnar (giants) who coupled with the gods. 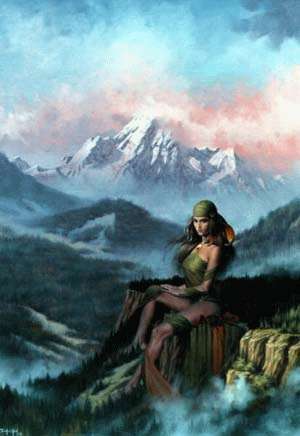 Jord (also known as Fjorgyn, or Hlodyn) is one of the Aesir, an earth goddess as well as a giant, she was the mother of Thor and the mistress of Odin. Some say that she was Odin’s first wife but the interpretations are unclear as to whether that is the case. According to one story, Odin sought to father a son whose power would derive from Earth as well as Asgard, and hence he sought to mate with Jord. Odin created a cave in Norway where Jord gave birth to Thor. Months after the infant Thor was weaned, Odin brought him to Asgard to be raised. Odin's wife, the goddess Frigg, acted as Thor's mother from that time onward. Not until years after his birth did Thor learn that Jord was his birth mother, and he has been busy protecting her ever since. Did you know that by being a creature of the earth, you are related to Thor as well? Do you know where your hammer is, and how often do you use it? Awesome post and happy Monday! I'm related to Thor? Darn, why did he get all the good looks? And where's my hammer? I love mythology of any kind, whether it's Greek, Celtic or Norse. I took a course in North mythology when I went back to college in my 50s, but don't remember much, so your posts help remind me of something I love learning more about. i used to know this stuff! Cool background of Thor. He's so much more interesting now! I hate that they took him away from his birth mother - why do gods DO that?